Russell Dean Bell, 60, of Hudson, Iowa died on Tuesday, April 26, 2005, after recently being diagnosed with esophageal cancer. He was born on February 9, 1945, in Clarksville, Iowa. He was the youngest of three boys born to John and Ena Bell. Russ graduated from St. Ansgar, Iowa in 1963, then moved to Cedar Falls to start working at John Deere. Russ was united in marriage with Sandra Stromley on September 19, 1964, and they made their home in Hudson, Iowa. Russ had served on the Hudson Fire Department for 36 years. He joined the department in February, 1969, and served as Fire Chief for 16 of those years. 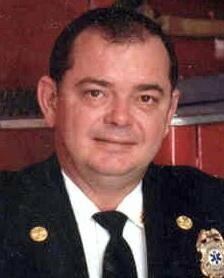 He was the longest active member in the history of the fire department. On April 7, 2005, he was honored with Distinguished Lifetime Member Award. Russ was also an active member of the Grundy County Honor Guard and was a social member of the Hudson AMVETS Post 82. After 35 years of working at John Deere, Russ retired in November, 1998. His love of working outdoors led him to a retirement job at Oakleaf Country Club in Reinbeck, Iowa. He became the grounds supervisor in 2000. Russ enjoyed farming with his dad and brothers as a boy and young man. He also enjoyed fishing, years of vegetable gardening, cooking, and socializing with friends. Russ is survived by his wife, Sandy; three daughters: Renae Wason of Dunkerton, Sue (Dave) Pearl of Aston, Pennsylvania, and Karen (Chad) Smith of Waterloo; six grandchildren: Shelbe, Hunter, and Landon Wason, Zachary Pearl, and Parker and Brody Smith; two brothers, Harlan Bell of Cedar Falls, and Jim (Nancy) Bell of St. Ansgar, Iowa; brother-in-law and sister-in-law, Jim (Diane) Stromley of Broomfield, Colorado; four nieces; and one nephew. Russ was preceded in death by his parents.